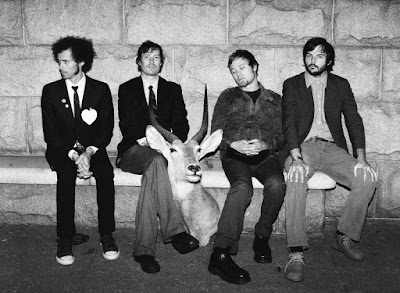 Rogue Wave formed in 2003 and is the brainchild of Zach Rogue. I saw them in February 2006 at Emo's when they opened for Nada Surf and was definitely impressed, they sound great live. Earlier this year they opened for Death Cab For Cutie. The Oakland band has three albums, with the most current being Asleep at Heaven's Gate released via Jack Johnson's label, Brushfire Records. The current band lineup consists of Zach Rogue (vocals, guitar), Pat Spurgeon (drums, samples, guitar, vocals), Gram Lebron (keyboards, guitar, drums, vocals) and Patrick Abernethy (bass, vocals), who replaced Evan Farrell in 2007. Farrell himself had replaced original bassist Sonya Westcott in the fall of 2004. On the weekend of December 22-23, 2007 Farrell died in Oakland CA, suffering from "massive smoke inhalation" in an apartment fire caused by a dangerously obsolete gas fired floor furnace. Here's the video for "Lake Michigan" off of Asleep At Heaven's Gate.